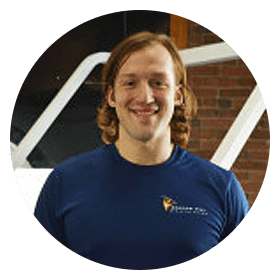 Steve obtained his Certified Personal Trainer certificate through the American College of Sports Medicine and has recently completed his Bachelor’s degree in Sports Management. Steve successfully competed at the high school and collegiate levels in the sport of rowing. His current personal fitness goals are at the extreme ends of the fitness spectrum including improving his marathon time while continuing to build his maximal strength. Steve works well with average people seeking to improve their general health, quality of life, and base athletic level and physical skill set through effective training. However, he also has an understanding of the mindset and motivation of the competitive professional or amateur athlete.